But cant keep up with what I got…. Oh ya we will, oh ya we will! Bright Eyes is an American indie rock band founded by singer-songwriter and guitarist Conor Oberst. It consists of Oberst, multi-instrumentalist and producer Mike Mogis, trumpet and piano player Nate Walcott, and a rotating lineup of collaborators drawn primarily from Omaha’s indie music scene. They are signed to Saddle Creek Records, a Nebraska-based label founded by Conor and his brother Justin Oberst and distributed by Sony Corporation. It turns out that Bright Eyes is going to be at the Hardly Strictly Bluegrass music festival in San Francisco (October 1-3) which IS, may I add, FREEEEEEEEE! Two other bands/artists that are going to be there are DeVotchKa, Joe Purdy, and BROKEN SOCIAL SCENE! I CANNOT WAIT. Can I take this all in? Did I give it all? Friendly Fires are an English band from St Albans, Hertfordshire, England. They are currently signed to XL Recordings. Their self-titled debut album was released on 1 September 2008 and was announced as one of the shortlisted twelve for the 2009 Mercury Prize on 21 July 2009. They have toured extensively, with past performances taking place throughout the UK, Europe, Japan, USA, Canada, Mexico, South America and Australia. The Wombats are an indie rock band formed in Liverpool, England. The band comprises native Liverpudlians Matthew Murphy (lead vocals, guitar, nose harp, keyboard) and Dan Haggis (drums, percussion, keyboard and backing vocals), alongside Norwegian-born Tord Øverland-Knudsen (bass guitar, guitar, keyboard and backing vocals). The band is signed to 14th Floor Records and Bright Antenna in the United States. 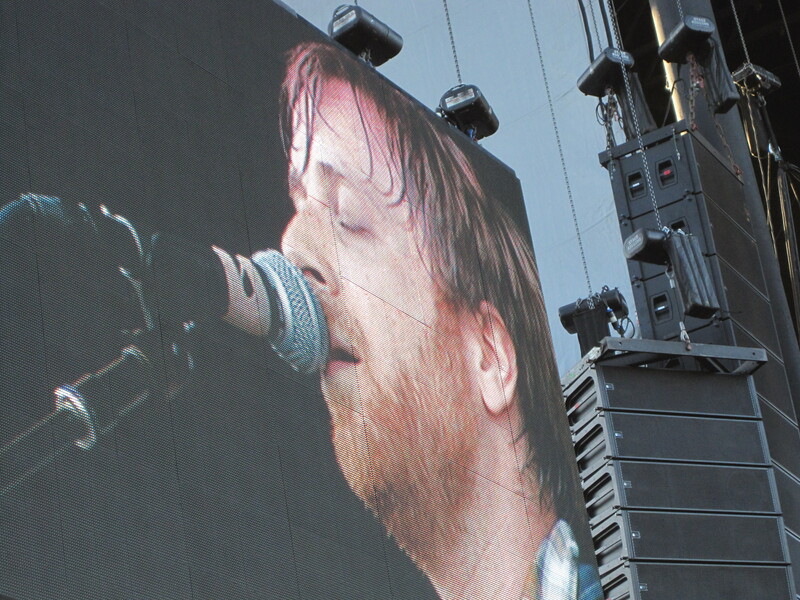 In April 2008, the band put out their first U.S. release on Bright Antenna, That summer, the band performed live at a number of major festivals, including Glastonbury Festival in June and T in the Park in July, and Reading and Leeds. In September 2010, the band announced they were near to completing their second studio album in the MRG Recording Studio in Los Angeles, California. The Wombats also played at the 2011 Southside and Hurricane music festivals in Germany, the latter of which Lisa Pfisterer also went to! In describing their next album, Tord says, “You take the electro and you take the grunge and you put it together with what we used to do on the first album…then that’s what the album’s going to be.” I’m looking forward to it! Why’d you think i’d put out your fire? don’t you know i breathe in fire? I thought that maybe I would have heard ‘Fiya’ live when I saw tUnE-yArDs just recently at the Outside Lands music festival in San Francisco, but no; INSTEAD, I was ENTRALLED by the KICKASS SONGS on her NEWEST ALBUM, WhoKill. 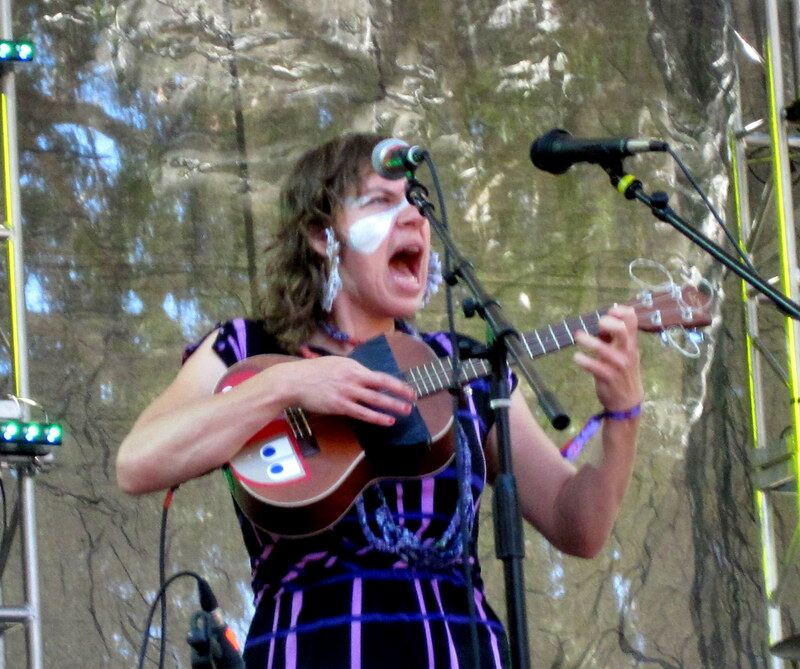 tUnE-yArDs was hands down the HIGHLIGHT of the weekend for me. One of the le siiiiiiiiiiiiiiiiiiickest live performances I’ve ever seen. SURREAL on so many levels. She kicked off her set with “DO YOU WANNA LIVE?! !”, a song that is not on any of her albums but is CRUCIAL in getting people to STOP IN THEIR TRACKS and turn and DROP THEIR JAWS, wondering what the heck that MUSICAL MAGIC is on stage and who the heck is behind is. 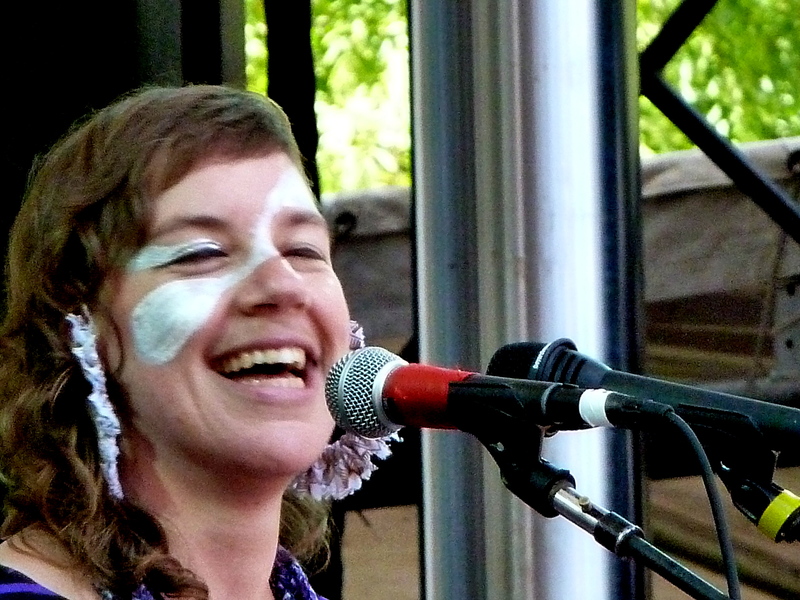 Yeah, she’s called tUnE-yArDs, and she’ll be TUNING YOUR EMOTIONS for the rest of your life. I’d since been telling people to pardon my uncontrollable urge to shout out “DO YOU WANNA LIVE?! !…YEAH!” for the next few weeks, cause I will. It was THAT GOOD. 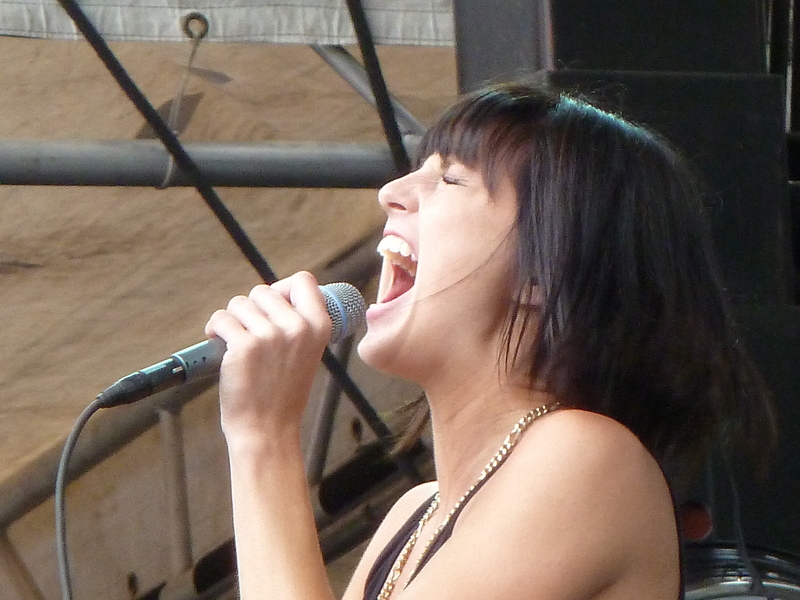 I just love her unique style and her incredibly raw talent in creating all sorts of crazy sounds from everyday items (glass bottle, microphone stand, etc.). It was absolutely UNREAL to see her create that magic from only a few feet away! Her looping of ukulele with vocals and percussion is like nothing I’ve ever heard before. She IS her OWN GENRE. Also, she clearly LOVE WHAT SHE DOES and it definitely comes through in her music. 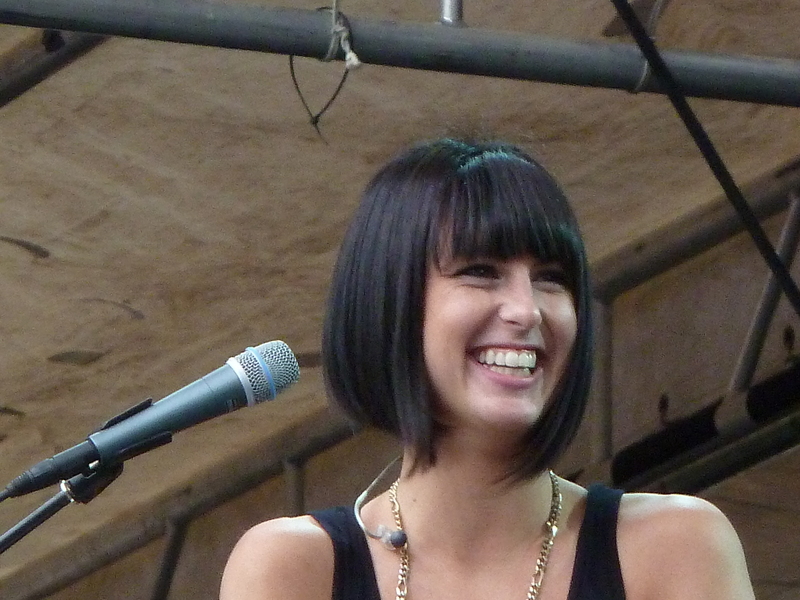 It’s one thing to see someone rocking out…but to see someone rocking out WEARING A SMILE?…now that’s just CONTAGIOUS! ‘You can come to me’ is song from a band that was recommended to me by Nicole DeJesus (yet again). After listening to a few songs from their album, I was immediately drawn to ‘You can come to me’ because of the cool beats in beginning…they just made me happy. They lyrics aren’t the best, but I do like the line: “You can run, run, run…But you can’t escape.” Simple, but it gets the point across. It also kind of hits home, since I very much try and run away (fugitive-style) when I find myself in a rut (simply cause I hate to bring others down). Funny, but true. The Helio Sequence is a duo of sonic landscapers signed to label Sub Pop. Their music environments are optimistic and uplifting with a dash of psychedelic. The band was formed in 1999 in Beaverton, Oregon, a suburb of Portland, Oregon, and consists of Brandon Summers on Vocals/ Guitars and Benjamin Weikel on Drums/ Keyboards (who has also played for Modest Mouse on Drums). The band produces an eccentric brand of indie rock mixed with electronic elements. To date, they have released two albums on Sub Pop, two on the Portland-based label Cavity Search and a self-released EP. Their fourth album, entitled Keep Your Eyes Ahead, was released on January 29, 2008, by Sub Pop. The Helio Sequence toured with the British band Keane (who I also really like) through the U.S.A. and in June, 2010 they were Keane’s support act in several gigs through Great Britain during the British band’s Night Train Tour. ‘Possibly Maybe’ is a song that I know very well because it used to be on the warm-up mix for a Modern Dance class that I took for “shits and giggles” my senior year at Bucknell University. My friend Tammy Ioanilli and I used to bite our lips and hold back laughter EVERY CLASS because this song (inappropriately sexual in itself) used to come on when we just HAPPENED to be in the most sexually suggestive yoga pose for warmup. The timing was always incredibly impeccable- EVERY TIME. What made the situation even MORE hilarious is that NO ONE else seemed to realize how sexual the lyrics of this song were but US! Um, HELLLLLLLO. Haha. We actually used to get a kick out of watching the uncomfortable mannerisms of the 4 boys in the class (including the one who we nicknamed “Jessica”), who HAD TO have felt awkward in a class full of 25 girls. SO MANY LAUGHS…EVERY CLASS. The “possibly maybe, probably love” is such cool little line that definitely sends a message of hopefulness, but yet “tease.” Lovely lil’ balance. Björk Guðmundsdóttir is an Icelandic singer-songwriter, occasional actress, music composer and music producer, whose influential solo work includes eight solo albums and two original film soundtracks. Her eclectic musical style has achieved popular acknowledgement and popularity within many musical genres, such as rock, jazz, electronic dance music, classical and folk. Her voice has been acclaimed for its distinctive qualities, such as being ranked #8 on MTV’s “22 Greatest Voices in Music”. ‘Chop and Change’ is a song by The Black Keys that was featured on the soundtrack of The Twilight Saga: Eclipse movie. I don’t watch those movies at all (and don’t really watch tv for that matter), but I came across this song on YouTube when I was looking up some other artists (Bon Iver and St. Vincent) that also ended up being on this album. These Twilight movie soundtracks have a surprising number of stellar artists on them: Bon Iver, St. Vincent, Muse, The Black Keys, Florence & the Machine, The Strokes, Death Cab for Cutie, The Killers, Metric, Sia, Thom York, The Bravery, Civil Twilight, Grizzly Bear, and Vampire Weekend. Not too shabby for some Vampire movie! ‘Night Bus’ is an absolutely GORGEOUS acoustic track that I stumbled upon when listening to some Bombay Bicycle Club songs on YouTube. It turns out that Lucy Rose, the beautifully unique female voice behind this track, is also the female singer for Bombay Bicycle Club (one of my new favorite bands). Although Lucy only started gaining notoriety as the featured artist on the title track of their 2010 album, Flaws, she has actually been playing open mics in London since she was 18 yrs old. According to an interview with Lucy Rose performed by CLASHMUSIC.com, she has hopes of making an album “one day,” following up her debut single, ‘Middle Of The Bed’ (release Aug 8, 2011). ‘Race out’ is another song that you need to give a chance and listen all the way through because it’s the EXPLOSION OF SOUNDS at ~1:48 that makes your heart feel like it’s going to RACE OUT of your chest! Wow, Battles, way to do it again. You guys are SIIIIIIIICK. 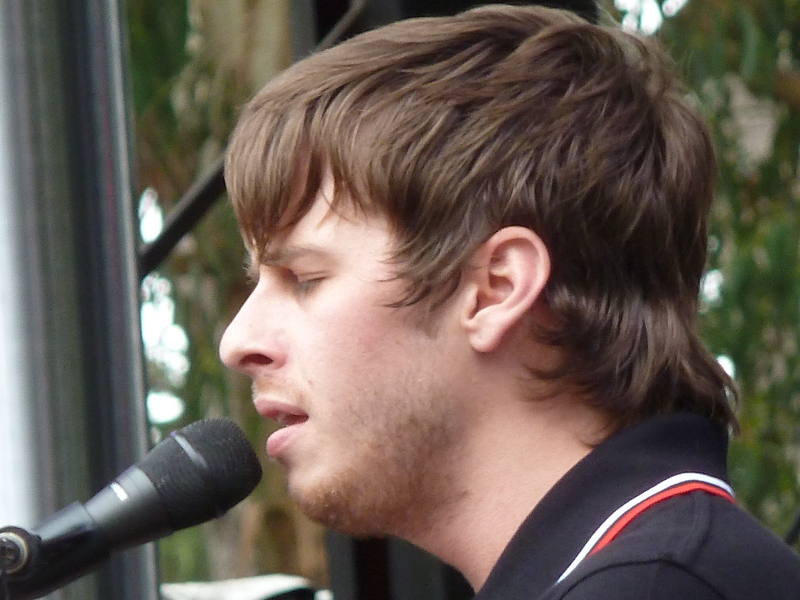 ‘Waste’ is a one of my favorite songs by Foster The People, and I feel so lucky to have seen it performed UP CLOSE and PERSONAL at Outside Lands musical festival this year in San Francisco. I also really dig the abrupt ending to this song…Pretty cool. ‘Heavy in Your Arms’ is a song that I came across after seeing it amongst the list of stellar artists on the Twilight movie soundtrack. I absolutely LOVE Florence & the Machine and was super stoked to see that she had an extra song for this movie that was not available on her Lungs album. I thought ‘Wisdom of Antiquity’ was just a pretty chill song that had some interesting layers of sounds and also a pretty intriguing opening line: “Whenever a civilization looks soon to be a lost civilization, then that civilization IS OURS.” Pretty cool.